By the time we are reading this, our forty-first Caldecott book, it has become clear to me that people of the 1940’s must have been very intrigued with other cultures and countries since so many award-winning books written during that period have these common themes. 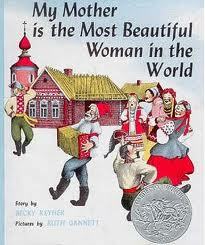 My Mother is the Most Beautiful Woman in the World, written by Becky Reyher and illustrated by Ruth Gannett, is a retelling of a Russian folktale. In this story a little girl gets lost during a harvest-time feast. When asked about her parents all she can say is that her mother is “the most beautiful woman in the world.” The villagers sort through all of the gorgeous women nearby for the child’s mother, but are surprised when they find that her mother is a rather homely looking lady. In the end, the mother tells her daughter that she is happy that her daughter sees beauty not only with her eyes, but also with her heart. 1. “Excellence of execution in the artistic technique employed.” – Stippling and pointillism, a painting technique in which small, distinct dots of color are applied in patterns to form an image (http://en.wikipedia.org/wiki/Pointillism), are used throughout this book. While I did not find these illustrations particularly beautiful, they are artistically detailed, and maybe that is the point given the storyline. 2. “Excellence of pictorial interpretation of story, theme, or concept.” – While I did not find these illustrations particularly dazzling, they are artistically detailed, and maybe that is the point given the storyline. 3. “Appropriateness of style of illustration to the story, theme or concept.”- A peasant Russian style is evident throughout the story. 4. “Delineation of plot, theme, characters, setting, mood or information through the pictures.” – Each one of these literary aspects is clearly defined through the illustrations.